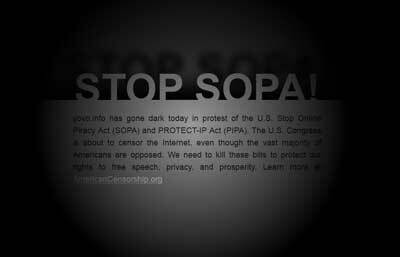 Today’s unprecedented Internet protest against SOPA/PIPA censorship laws was a huge success. Thousands of websites observed a “blackout” and even Google displayed solidarity and has forms posted for contacting lawmakers. So far 13 Senators – mostly Republicans – have withdrawn their support for PIPA. This is not a partisan issue. Rather, this issue pits techies against Hollywood special interests. The Democrats apparently are so beholden to Hollywood interest that they are handing this debate to the Republicans. On a silver platter. In an election year. This entry was posted on Wednesday, January 18th, 2012 at 9:58 pm	and is filed under geeks, word up. You can follow any responses to this entry through the RSS 2.0 feed. You can skip to the end and leave a response. Pinging is currently not allowed.